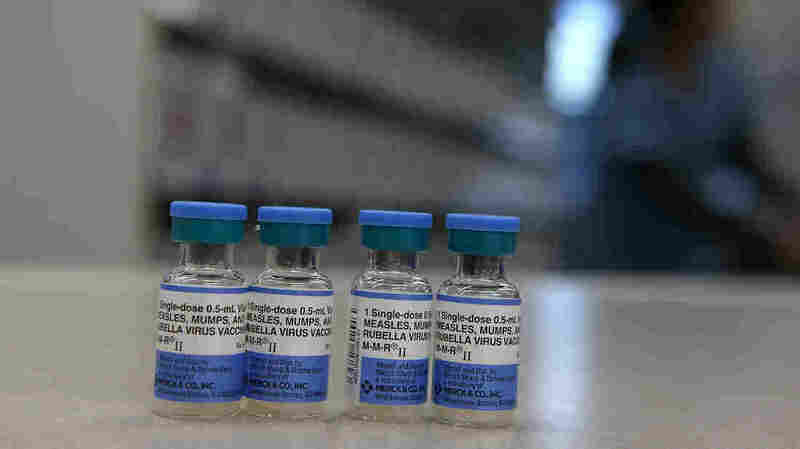 Measles, mumps and rubella vaccine ampoules will be exhibited at a Walgreens pharmacy counter in Mill Valley, California, in 2015. A Texas hospital has broken ties with a nurse who appears to be reporting a young measles patient in a Facebook group dedicated to "anti-Vaxxers" who reject scientific evidence of vaccine safety and efficacy. Screenshots show a self-proclaimed nurse who says the sick child's symptoms helped her understand why people vaccinate her children, but that "I will continue my little Vax journey without remorse." The Texas Children's Hospital reports to NPR via email that a nurse has "posted protected health information to a patient on social media." The hospital did not call the nurse. "We take this matter very seriously because the privacy and well-being of our patients are always the highest priority," says the spokeswoman for the hospital, Veronika Javor-Romeis, NPR. "After an internal investigation, this person is no longer with the organization." She also confirmed that the hospital treats a measles patient, and that the hospital rates the risk to other children who may have come in contact with the patient. "This is a highly contagious, vaccine-preventable infection," said Javor-Romeis. "We know that vaccination is the best protection against measles." The measles vaccine is extremely effective. But to prevent outbreaks and protect those who are not vaccinated, a sufficiently high percentage of the population must be vaccinated to create "herd immunity". Lower vaccination coverage for measles and other preventable diseases has been linked to outbreaks in the US and Europe. Experts point to anti-vaccine sentiment, fueled in part by a fraudulent newspaper in the late 1990s that spread false information about immunization risks. The Texas Children's Hospital did not specifically want to comment on whether the nurse's immunization role played a role in the hospital's investigation and the departure of the nurse. Javor-Romeis says that all employees are "strongly encouraged" to receive routine vaccinations, and that employees who log out may not be allowed to work in certain areas of the hospital. The anti-vaccine Facebook posts in question were apparently shared in a group called "Proud parents of unvaccinated children – Texas." At the beginning of this month, the group had more than 5,000 members. The group has since been deleted. But a Facebook user has posted screenshots of the nurse's contributions on the Facebook page of Texas Children's Hospital, and the Houston Chronicle says he also took screenshots of the comments. According to these screenshots, a user who said she works as a PICU / ER nurse on the Texas Children's West Campus said Hospital, the group: "For the first time in my career, I've seen measles this week." "Honestly, it was tough, this kid was super sick … it was awful," she said. "By no means did I change my vax attitude, and I'll never do it, but I just wanted to share my experience and how much worse it was than I expected." She said she understands how some parents vaccinate "out of fear," as she put it. In a follow-up, she said she had deleted some answers so as not to risk her job, repeating, "We are not wrong in our beliefs / beliefs." Another screenshot shows that she thought she washes his mouth to bring a measles sample home to her child. "We are aware of this situation and have initiated a thorough investigation," the hospital said on Facebook. "We take these things very seriously." "The views of this employee do not represent those of the organization," the hospital added shortly afterwards. The screenshots were distributed to the hospital Friday, a few days before the Texas Children's Hospital or the Houston Health Department officially announced that a patient had the measles. On Monday, the Houston Department of Health said that the case, which it referred to as "suspicious" measles, affects a child aged 1 to 3 who has recently traveled overseas. Prior to this patient, the last confirmed case of measles in Houston was in 2013, reports ABC 13.